In beautiful shades of purple, pink and white, the continuous blooms of African violets will add bursts of color to your windowsill for years to come. Many gardeners shy away from these little indoor tropical plants, but we’re here to tell you there is no need. With a bit of guidance and proper care, you can easily add them to your collection of houseplants. 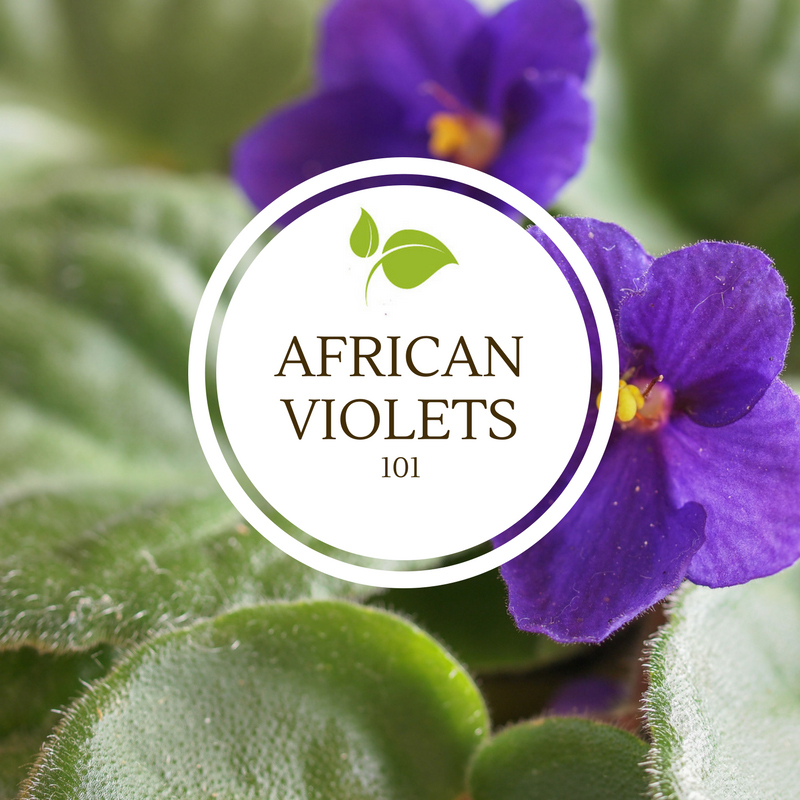 As with any other plants, African violets need all of the necessary elements to stay healthy; light, water, soil, food, and air. LIGHT: Adequate light is the most critical factor in promoting flowering. Place plants near any window that has bright, but filtered, light. An east window is best because it gets morning sun. A thin curtain will be necessary if placing plants in a south or west window. In order to develop a nice symmetrical form, plants must be turned 1/4 turn every week. WATER: More violets die from over-watering than from any other single cause. Violet soil should be kept evenly moist and never allowed to become soggy. Water only when the top of the soil is dry to the touch. Always use tepid water. You can water from the top or bottom, use wicks, or use self-watering However, about once a month, plants should be watered from the top to flush out accumulated fertilizer salts. Never allow plants to stand in water and if water gets on the leaves, dry with a paper towel to prevent leaf spotting. SOIL: A potting medium suitable for African violets should be sterilized, and light and airy to allow root penetration. Soil-less mixes are ideal – they contain sphagnum peat, vermiculite, and We recommend Espoma Organic African Violet Premium Potting Mix. FOOD: Lack of regular feeding is one of the reasons an African violet will not bloom. The best way to feed is to use a dilute fertilizer solution every time you water. Use 1/8 to 1/4 tsp. of fertilizer to one gallon of water. A balanced fertilizer should be used, such as Bonide Liquid African Violet Plant Food 7-10-7. It is best to use a fertilizer with a low nitrogen urea content as urea burns the roots. AIR: Temperature and humidity are important factors. Most violets can tolerate temperatures between 60 and 80 degrees. Ideal temperatures are 72-75 degrees day-time and 65 degrees night-time. The preferred humidity range is 40% to 60%. A humidifier or bowls of water placed near plants can be used to increase your home’s humidity during the heating season. For continued care, African violets should be repotted once a year. They tend to like tight pots, so use a new pot that is only slightly larger than the old one. Remove one-third of the old soil and replace it with new and make sure the crown of the plant is just above the soil line and water thoroughly. If taken care of, your new African violet will reward you with beautiful blooms all year long.